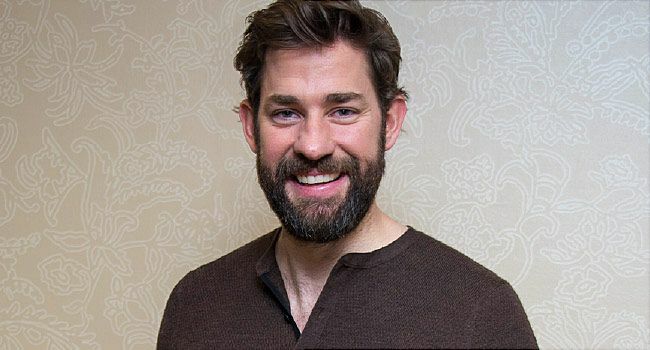 For nine seasons, actor John Krasinski’s best-known character, Jim Halpert, rarely strayed beyond the dreary confines of Scranton, PA-based Dunder Mifflin, the fictional paper company that was the setting for NBC’s hit comedy The Office. On Aug. 31, the 38-year-old actor returns to TV after a 5-year absence, and fans of Jim should prepare themselves for someone wholly different. Krasinski’s new television incarnation takes him all over the globe. Cast as Jack Ryan in the eponymous Amazon series based on Tom Clancy’s best-selling thrillers, Krasinski plays a CIA desk jockey who wants nothing more than to analyze data and write reports. But he doesn’t remain in his office for long. Krasinski’s character finds himself propelled into a worldwide hunt for a terrorist. The series, Krasinski says, will follow a different plot each season but won’t draw on storylines from Clancy’s books. The first season, for example, offers an origin story. Viewers will watch the young Jack Ryan transform himself from a guy clearly in over his head to a formidable operative able to take on the worst enemies of the state. Rest assured: There will be explosions. But before he was an action hero, Krasinski grew up the youngest of three brothers in the Boston suburb of Newton. In 2001, he graduated from Brown University and moved to New York to be an actor. Four years later, he got his big break. The Office, based on a British series of the same name, won five Emmy awards and received more than 40 Emmy nominations. One of its biggest draws: The on-screen romance that developed between Krasinski’s Jim, a paper salesman, and receptionist Pam Beesly, played by Jenna Fischer, as they weathered the painfully hilarious ineptitude of their boss and other comic extremes of office culture. In real life, Krasinski is married to the English actor Emily Blunt, with whom he has two daughters, Hazel, 4, and Violet, 2. He also appeared on the big screen, in the romantic comedies License to Wed and Something Borrowed and the historical drama Leatherheads. In 2016, he starred in 13 Hours, which chronicled the 2012 attack on the American diplomatic compound in Benghazi, Libya, and the efforts of a small security team, led by Krasinski’s Jack Silva, to protect those trapped inside. For that role, Krasinski had to get ripped. He spent 3 months punishing himself with muscle-building bench presses, rack pulls, sled drags, and deadlifts. He limited his diet mostly to chicken, salad, and water. His new, 9% body fat physique made headlines. It also set him up with a base of physical fitness that he works to maintain. Krasinski has put his buff body to a good cause: veterans’ issues. In August 2016, he took the 22 Pushup Challenge to raise awareness about mental health issues faced by military veterans. The name comes from a grim statistic: In 2013, the Veterans Administration estimated that, on average, 22 veterans commit suicide every day. Veterans’ risk of suicide is 22% higher than that of non-veterans. Like the ice bucket challenge before it, the 22 Pushup Challenge went viral, as celebrities dropped, did pushups, then posted the videos to social media. Actor Chris Pratt challenged Krasinski, and Krasinski in turn challenged the man who directed his 13 Hours training regimen, Jason Walsh, as well as Captain America star Chris Evans. On Memorial Day 2017, Krasinski and Pratt together took up the Murph Challenge, a brutal workout done wearing body armor. The challenge raises money for a scholarship that honors Navy Seal Lt. Michael P. Murphy, who was killed in Afghanistan 2005. Krasinski also has reasons closer to home to keep fit: his children. His latest film, A Quiet Place, which premiered in April and which he directed and co-wrote, serves as an amped up metaphor for Krasinski’s own apprehensions about his ability to keep his daughters out of harm’s way. It takes place in a post-apocalyptic world in which much of the population has been wiped out by vicious creatures that hunt by sound. Make a noise, and you die. Krasinski plays a father of two and husband to a pregnant wife, played by Blunt, 35. Together, they try to survive by living silently, surrounded by monsters. Their daughter in the movie is deaf, played by deaf actor Millicent Simmonds. Krasinski, who had the entire cast deliver their lines in sign language, says Simmonds helped him better portray the silent world in which the family lived. "It was non-negotiable for me to cast a deaf actor in the role," Krasinski told the LA Times. It’s a terrifying movie filled with jump scares and hold-your-breath tension. But it’s much more than that to Krasinski. Real life, of course, most often comes with more mundane concerns, but that does not make them any less real to parents. Psychologist Paul Donahue, PhD, says that parental worry is perfectly natural, but moms and dads need to pay attention to it and understand how it affects their children. One possible result: separation anxiety. The children become distressed and resist, for example, when their parents leave them at a friend’s house or the babysitter has arrived for the evening. Donahue emphasizes that one critical goal as a parent should be the child’s eventual independence, their ability and desire to navigate the world on their own. “We need to teach them how to be safe and smart without giving them the sense that the world is a very scary place,” Donahue says. But Krasinski and Blunt, who married in 2010, don’t plan to always shield their daughters from the scarier parts of the world, especially when they have hope for change. The couple supports the Malala Fund, a nonprofit founded by 2014 Nobel Peace Prize winner Malala Yousafzai. The fund works to provide schools and education to girls in countries where they’re often denied basic opportunities, such as Pakistan, Afghanistan, India, and Nigeria, as well as countries that now host Syrian refugees. “Eventually, we want to visit the schools that Malala has founded, and we want to bring our girls along with us so that they can see the important work that’s being done and the difference that’s being made,” Krasinski says. To raise awareness -- and money -- Krasinski and Blunt raffled a double date to the Los Angeles premiere of A Quiet Place for a lucky donor to the fund. “It’s such an important cause, and it just makes sense to commit to it,” Krasinski says. Over the years, Krasinski has also helped raise money for cancer research. In 2013, for example, he hosted a gala at Massachusetts General Hospital Cancer Center in Boston that tallied $1.3 million in donations. In 2015, Krasinski and his wife joined celebrity chefs Ming Tsai and Masaharu Morimoto for a live broadcast cooking show to raise money for Family Reach, an organization that supports families of children with cancer. The event raised $400,000. As Krasinski and Blunt focus on their daughters and their careers, they sometimes must confront separation anxiety of their own. In recent months, for example, the production schedule for Jack Ryan required Krasinski to be in Montreal for extended periods. At the same time, his family had decamped for London, where Blunt was filming the reboot of Disney’s classic Mary Poppins. “In a perfect world, neither of us would be working at the same time, but that’s not the nature of the business,” says Krasinski, who flew to London every week to join his family. It’s a subject that he and Blunt raise with their daughters. No one parents completely free of worry, Donahue says. But you must find a balance between your urge to protect and your child’s need for independence. These tips will help you and your children. Take cues from experienced parents. Your own parents or friends of older children can be models and offer feedback on concerns like safety. Talk to teachers. Your child’s teacher can help you better understand that risk-taking -- running fast, climbing, and other physical activities -- is an important part of being a kid. Project confidence. When you drop your child off at school or a friend’s house, put on a brave face. Your demeanor will let your child know that everything’s OK.
Know the signs. Is your child afraid to try new things or take risks, like getting on a swing? Some anxiety when a child faces the unknown is normal, but be alert if it gets in the way of everyday activities. Get some rest. Lack of sleep will contribute to your own anxiety, which then gets transmitted to your child. Seek help. If you struggle to let go of your fears, talk to a mental health professional about counseling for you and, possibly, your family. Paul Donahue, PhD, founder and director, Child Development Associates, Scarsdale, NY.